Oil, 37 cm x 46 cms. Private collection. This striking picture by Hubert Robert depicts the royal family attending mass in the Galerie de Diane at the Tuileries Palace in 1791. 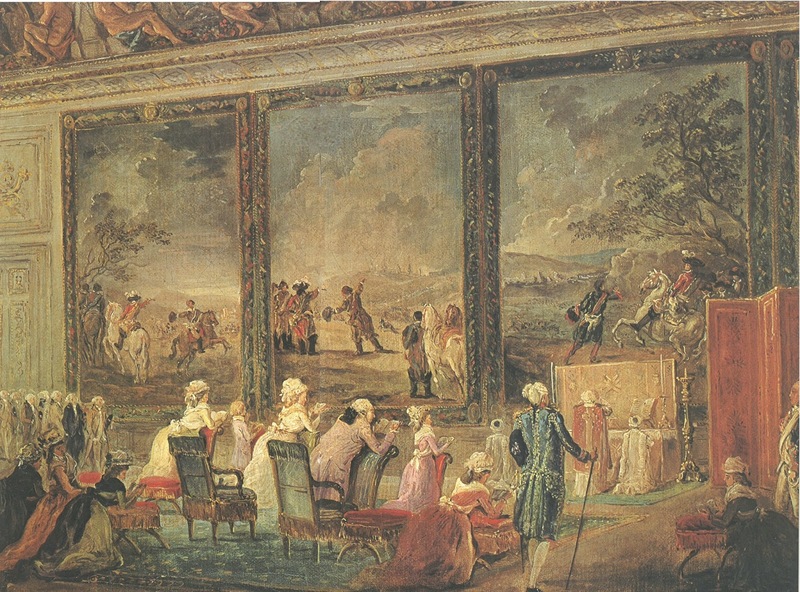 The gallery, with its tapestries - after Van der Meulen's "Conquests of Louis XIV" - makes for a arresting composition; despite the grandeur of the surroundings and the crowds of onlookers gathered to the left of the canvas, it is a touchingly intimate portrait of the royal family at prayer. Although the canvas has traditionally been called "La dernière messe de Louis XVI et de la famille royale aux palais des Tuileries", the occasion cannot in fact be the "last mass" of 9th August 1792 since access to the gallery was closed off following the flight to Varennes. Palm Sunday of 1791 has been suggested. Another possibility is Whitsun; I came across a reference to a work by the artist Jean-Baptiste Mallet (1759-1835) "Messe de la Pentecôte 1791 à la galerie de Diane" which may represent the same occasion. It is not clear why the royal family preferred to hear mass in the Galerie de Diane rather than in the chapel at this time, though it should not be presumed that they were constrained to do so or that the venue was imposed on them as a "makeshift" arrangement. Presumably Robert, who lodged in the Tuileries, was invited to paint the picture and, to this extent, it was a public occasion. Interestingly the painting originally belonged to Madame du Barry; it was listed in the inventory of her possessions drawn up in 1793. Joan Haslip, in her biography, specifies that it was a gift from Du Barry's lover the duc de Brissac, though this may be just an inference. In the 1930s and 40s it belonged to the Parisian collector Henri Loyer. It was reproduced in François Laurentie's Louis XVII (1913), a limited edition work of 85 copies, and subsequently in Lenotre's study of the Tuileries in 1933. This coloured version is scanned from Marguerite Jallut's Marie Antoinette (1970). As far as I can discover the picture was last exhibited in 1989 and 1993 when it was listed as being in a "private collection". 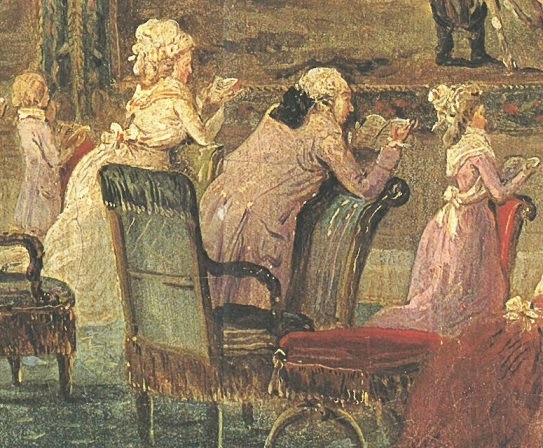 Marguerite Jallut in her Marie Antoinette and her painters (1955), p.64 said that the ascription to Robert was not absolutely certain, but it now seems generally accepted. Note 64: "Cette toile achetée en 1791 par Mme Du Barry, appartient à M. Henri Loyer. Elle a été reproduite par M. François Laurentie dans son Louis XVII (1913)"
As far as I can work out from Google snippet-view the picture was shown (or referred to) in the following exhibitions.